The Warrumbungle National Park region was discovered by Europeans in 1818 by John Oxley while looking for an inland sea. The name of the mountain range, 'Warrumbungle,' means crooked mountains in the local Kamilaroi Aboriginal language. There is evidence of Aboriginal use and known occupation sites within the park. The idea of a reserve to conserve the area of the Warrumbungles was first entertained by the National Parks and Primitive Areas Council in 1936, with the first area being conserved in 1953. The national park takes up some 23 000 hectares, 33km west of Coonabarabran and 90km north of Gilgandra. More areas are to be added to the park in the future. It is a park of rocky spires, ridges, domes and gorges. The rocky peaks include the famous Breadknife, Bluff Mountain and Grand High Tops, which are an extremely popular destination for bush walkers. 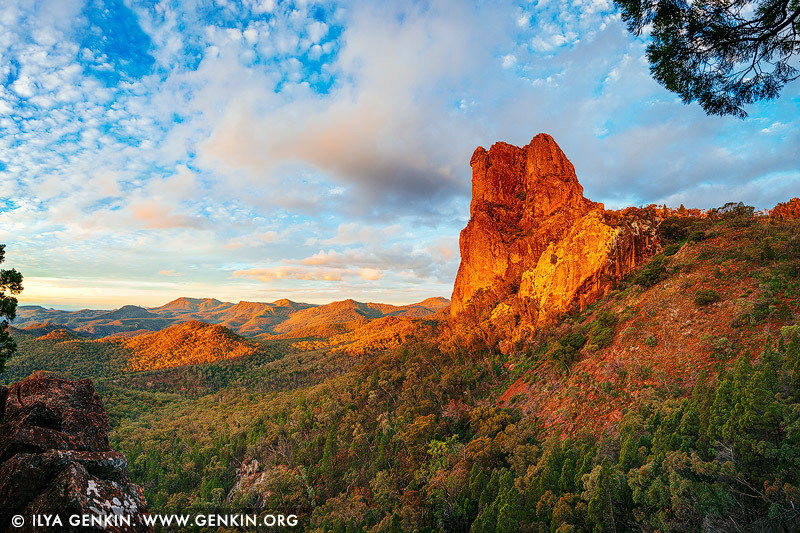 This image id AU-WARRUMBUNGLES-0005 of Belougery Spire at Sunset, is copyrighted © by Ilya Genkin. This is not a public domain image.